Provide comfort for the family of Kathleen "Kathy" Cole with a meaningful gesture of sympathy. 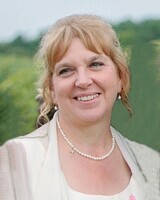 Age 61 of Hector, NY, passed away peacefully at home surrounded by the love of her family and closest friends. She is survived by her loving husband, Chris Cole, two daughters, Jenna Wilkens (John Wilkens) and Jillian Cole, her brother David Moser (Dawn Moser) and her grandchildren Thea and Maryn Wilkens. Kathy spent her life creating, nurturing and spreading beauty. During the spring and summer, you could usually find her in her garden cultivating an abundance of beautiful flowers and fresh fruits and vegetables. She was an excellent cook and enjoyed finding new recipes to surprise her family. Her touch is far reaching through her devotion to philanthropy. Kathy worked in fundraising and institutional advancement most of her life and spent the past 17 years as owner and president of West Wind Consulting. Through this work, she impacted countless individuals and organizations and developed many long-lasting friendships. Her approach was truly unique and will have a lasting impact on the philanthropic community. More than anything, Kathy loved spending time with her family. Her husband, daughters and granddaughters were the greatest joys of her life. To say she will be deeply missed is an understatement but she will continue to be an inspiration to the many lives that she has touched. In lieu of flowers, donations can be made to Planned Parenthood of the Southern Finger Lakes (www.WeArePlannedParenthood.org), Schuyler County Humane Society (www.SchuylerHumane.org) or the Food Bank of the Southern Tier (www.FoodBankST.org). Kathy worked closely with these organizations and felt passionately about their cause. A private memorial service will be held and details on a celebration of life will be released at a later time. You may express condolences to the family or “Light a Candle of Remembrance” online at www.RoyceChedzoy.com. Funeral arrangements entrusted to Royce-Chedzoy Funeral Home, Watkins Glen. To send flowers in memory of Kathleen "Kathy" Cole, please visit our Heartfelt Sympathies Store. We encourage you to share your most beloved memories of Kathleen "Kathy" here, so that the family and other loved ones can always see it. You can upload cherished photographs, or share your favorite stories, and can even comment on those shared by others. Provide comfort for the family of Kathleen "Kathy" Cole by sending flowers. Jillian, Jenna, and Chris -- Just a short time ago we were all sending messages and photos to Kathy for her 60th birthday celebration. Now she is gone. My deepest sympathy to all of you. I worked with Kathy as a board member at Planned Parenthood, and she was the consultant to a capital campaign I directed at The Food Bank of the Southern Tier. She was not only a sounding board and resource when we needed inspiration for our fundraising, but a dear friend who helped me through some difficult times, especially my husband's final illness. I will treasure memories of our working together, and I will miss her deeply. My heart goes out to Kathy's family - she will be missed. Kathy was a respected colleague who always had a ready smile, a kind word, and good ideas. My sincere condolences. Kathy was such a fine human being...caring, steady, wise. She was a special mentor. I am so very sorry she has left us but I know you have cherished memories to keep her close. I am deeply saddened by your loss. Kathy was always so kind to me, I know that she is very much missed by so many, Chris, Jenna and Jillian I cannot express my sympathies to you all enough. May your memories comfort you in the days to come.